Livie and Luca are designed for barefoot freedom, which mimics the natural freedom of bare feet, allowing children to naturally acquire balance, co-ordination and good posture. Livie & Luca offer a range of soles, each designed for different feet types. Their most popular shoe is on the turf sole, which is suitable for medium - wide feet, early walkers or children with high instep. Their honeycomb sole is suitable for medium width feet, and their narrowest sole, on the trac sole, is good for more confident walkers. 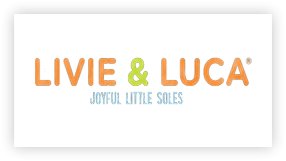 Livie and Luca offer a range of kids footwear that are a great vegan alternative, for those who prefer or follow a vegan lifestyle.